We’re all guilty of going too long without washing our makeup brushes. After we put our makeup on, we’re hurrying out the door, only to forget about how dirty our brushes are until we use them again. Your makeup crusts onto your brushes, leaving a (gross) gunky residue over time. What does that mean for your skin? Baked-on makeup harbors bacteria, and if you don’t clean your makeup brushes, all of that bacteria will find its way onto your face. This bacteria then finds its way into your pores, resulting in breakouts. Plus, clean makeup brushes last longer. We’ve broken the process down into 4 easy steps that will help you and your makeup brushes look and perform their best. Most of us have busy lives, so having clean makeup brushes are kind of towards the bottom of our to-do lists. Yet, it’s important to wash your face brushes at least once a week. Because these brushes touch your face the most, they can transfer the most bacteria to your skin. Your eye brushes should be washed at least every couple of weeks, and your other brushes can go up to a month without cleaning. Brush cleaners can be pricey and potentially damaging to those fine brush fibers. Many people like to use our Liquid Face and Body Wash to get the job done. Just like it removes gunk from your skin, it also removes the gunk from your favorite makeup brushes, saving you time, money, and a trip to Sephora. It’s gentle on your brushes and your skin. Win-win! To clean makeup brushes effectively, pour a little bit of brush cleaner or soap into the palm of your hand and add water. Cup your palm and move the brush in a swirling motion in the mixture. This helps the soap reach all the brush fibers, resulting in maximum clean. You can also massage the soap into the brush with your fingers. Additionally, if you want to go above and beyond, pick up a brush cleaning plate. This device acts as an exfoliator for your makeup brushes, ensuring maximum clean. When it comes to drying clean makeup brushes, you have two options. First off, you can let them dry flat on a paper towel or a cloth towel. Once they are dry, you may need to reshape the brushes with your fingers, since they may become distorted in the drying process. If you’d prefer to skip the reshaping step, hang the brushes vertically with the brush side down. This allows water to drip off of the brush fibers without changing the shape of the brush itself. When choosing the second option, you can either purchase a drying rack or create your own with this cool DIY. 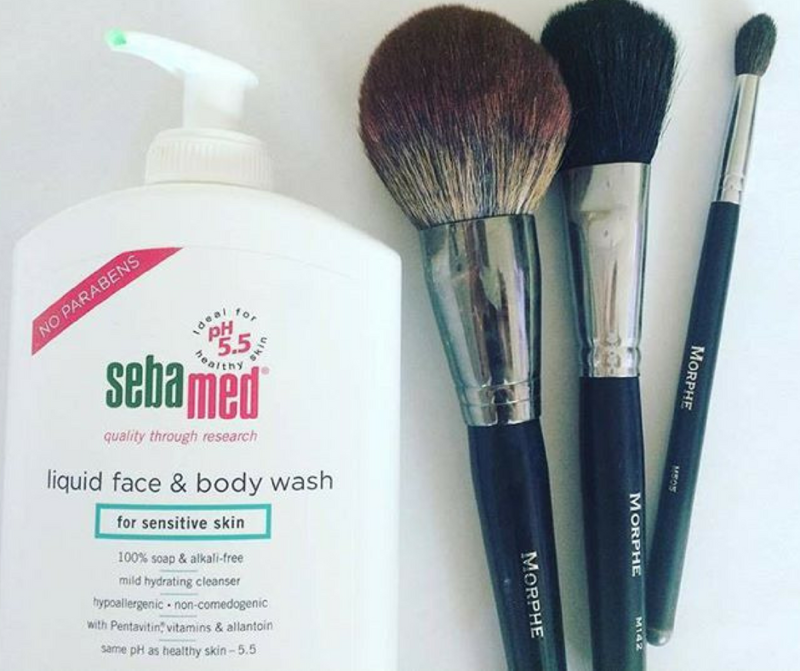 Sebamed comes in handy when you need to clean both your makeup brushes and your skin. Check out our full range of product here.